Most leading issuers increased net income in the recent quarter, as increases in revenues (both net interest income and noninterest income) more than offset rises in both noninterest expenses and provisions for loan losses. 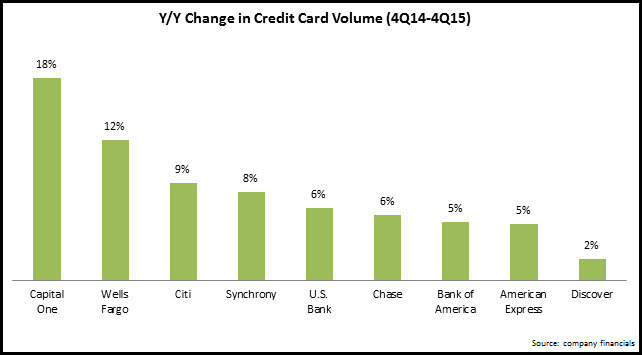 Growth in average outstandings was led by regional bank card issuers, as well as Capital One and Wells Fargo. SunTrust led all leading issuers with an increase of 20% to pass the $1 billion threshold, and it recently launched a new consumer card suite in order to continue this momentum. Wells Fargo’s 11% growth represented a decline from a 14% y/y rise in 3Q15. Although it continued to grow its credit penetration rate (to 43.4% of retail bank households) the rate of increase has slowed over the past year. The largest issuers (Chase, Bank of America, Citi) continue to report anemic loan growth or declines as they continue to deal with legacy issues. American Express had the largest decline (-4% y/y), but this was due to the loss of the Costco portfolio. In spite of their lack of outstandings growth, the leading issuers reported strong new account generation. Citi is ramping up new account acquisition for its core products (which account for 80% of its U.S.-branded card portfolio), with active accounts growing 13% y/y. Like Citi, American Express has ramped up new card acquisition, and its 2.1 million new accounts in the fourth quarter were well above its historic average. Bank of America grew new accounts 6% y/y to 1.26 billion in 4Q15. Issuers are focusing on new channels to drive new account acquisition, in order to reduce acquisition costs, as well as reflect changing consumer behavior. 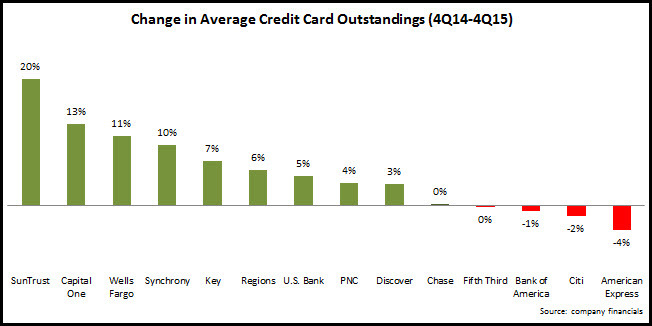 72% of new Chase card accounts in the fourth quarter came through the online channel. Synchrony reported a 73% y/y rise in applications through the mobile channel. Charge-off rates remain at historic lows, with continued y/y declines. However, most issuers reported rises in the charge-off rate from 3Q15. 30+ day delinquency rates also remain very low with little sign of upward movement. Therefore, we expect charge-off rates to remain at or near these very low levels in the coming quarters. Chase expects its charge-off rate to be around 2.5% in 2016, close to its current level of 2.42%. However, it is notable that all of the leading issuers increased their provision for loan losses, led by Capital One (+24% y/y) and American Express (+10%). In addition, the top issuers will try to translate the recent rise in new account generation into steady loan growth. Issuers in general will be looking to drive both volume and loan growth through initiatives targeting various stages of the cardholder life cycle: acquisition and activation, retention and ongoing usage. At the same time, they will continue to hope that charge-off and delinquency rates remain close to historic lows.